The New Dominion Virginia initiative focuses on Virginia’s recent history and architecture from 1946 to 1991, including history associated with LGBTQ communities and individuals in the United States and, more specifically, in Virginia (see link in right navigation box). 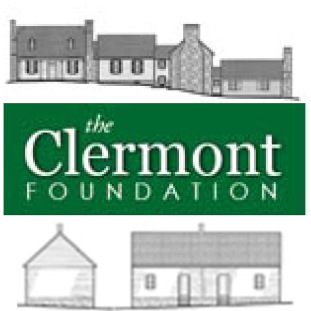 Our goals are to develop frameworks for evaluating historic resources associated with this period, to facilitate architectural survey, and to assist property owners, local governments, historical societies, and individuals and organizations with an interest in preserving the architectural and cultural landscape of a pivotal period in the Commonwealth. The New Dominion Virginia period begins in 1946 in the immediate aftermath of World War II and the beginnings of the Cold War as the United States and the Soviet Union emerged as fierce ideological and global military rivals. The Cold War encompassed a prolonged period of often tense international relations during which the U.S. assumed and never relinquished a mantle of global leadership. The dissolution of the Soviet Union in 1991 marked a dramatic end to this transformative period. Due to the extensive presence of military installations and federal government agencies in Virginia, the Cold War and its consequences proved to have far-reaching effects on every aspect of life in the Commonwealth. Consequently, the time frame of the Cold War, 1946-1991, also marks the beginning and end of the New Dominion Virginia period. In its broadest scope, the New Dominion Virginia period extends from 1946 to 1991, with the Cold War providing the overall time frame. Due to other historic trends, however, the period can be broken roughly in half: the first is 1946 to 1975, the second, 1976 to 1991. The oil crisis of the early 1970s, coupled with a significant slowdown in economic growth, marked a watershed in which the prevailing themes of the decades immediately following World War II gave way to those that would shape American life into the early 21st century. Here are the key themes marking the two halves of the New Dominion Virginia period. The New Dominion Virginia initiative is a deliberative multi-year, ongoing effort. If you would like additional information about how the initiative has been conducted, results to date, and next steps, please contact Lena Sweeten McDonald, Register Historian (804) 482-6439. DHR plans a multi-faceted effort to provide historic preservation professionals, local governments, property owners, preservation advocates, and other groups with places to begin learning more about the New Dominion Virginia period. The documents below are the research materials developed to date. All are considered works in progress and DHR welcomes suggestions for expanding and improving them. We also have incorporated as many online resources as possible, and would appreciate if broken links can be reported to Lena Sweeten McDonald, Register Historian. African American Architects in Virginia during the 19th and 20th Centuries: This document lists known African American architects who completed projects in Virginia from the Civil War through the late 20th century. It is based on Dreck Spurlock Wilson’s African American Architects, a Biographical Dictionary, 1865-1945 (New York: Routledge, 2004) and DHR’s architectural survey records. Civil Rights in Virginia Bibliography: This bibliography collects books, articles, websites, and other online materials that focus on the Civil Rights Movement (1940s-1960s) in Virginia, and currently has a limited number of resources about Virginia Indians’ rights, and women’s voting rights. 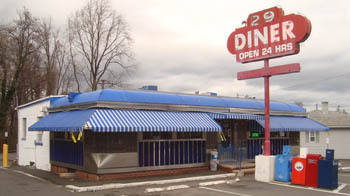 Historic African American Sites in Virginia (listed on the Virginia Landmarks Register and National Register of Historic Places). Biographical Sketches of Architects in Virginia: Prepared by Josh Howard, a Ph.D. student at Middle Tennessee State University, this document provides biographical sketches of a small selection of architects responsible for important Modern architecture projects in Virginia. Information Sources for Modern-Era Architecture: This document provides a compilation of online resources that have been created by State Historic Preservation Offices from across the U.S. and by the National Park Service. It was compiled in December 2012 by the Kentucky Heritage Council’s Marty Perry and National Park Service’s Paul Lusignan, with additional work by members of the Recent Past Preservation Network (http://recentpast.org). Modern Architecture Bibliography: This bibliography focuses on architectural design trends from the post-WW II period through the late-20th century. The majority of sources cited herein concern design trends both at the national level and specifically in Virginia. The materials focus on a variety of architectural resource types as well, although houses are the most commonly represented. Naval Cold War Architecture in Norfolk and Newport News: This research report prepared by Trip Butler, an academic intern at DHR, evaluates Cold War architecture at the U.S. Navy facilities in Norfolk and Newport News. 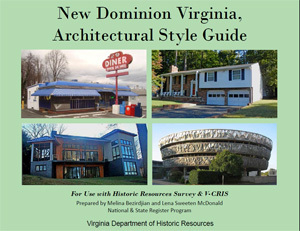 New Dominion Virginia Style Guide: The New Dominion Virginia Style Guide assists historic preservation professionals, local governments, preservation advocates, students, and interested members of the public with defining and documenting the numerous types and styles of post-WW II architectural resources in Virginia. 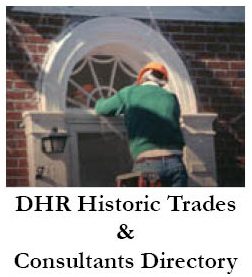 Additionally, the guide offers an overview of the major historic and architectural trends in Virginia from 1946 to 1991 and instructions on improving entry of survey data in DHR’s Virginia Cultural Resources Information System (VCRIS). 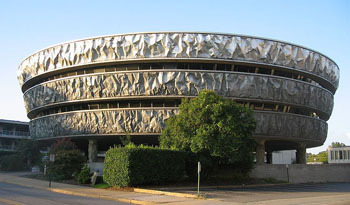 Notable Architects Working in Virginia, ca. 1945-1990: This document lists individual architects and architectural firms and some of the notable architectural projects they designed in Virginia during the New Dominion Virginia period. Notable Modern Architecture in Virginia, ca. 1940-1990: This document lists architectural resources in Virginia that have been identified as important examples of Modern architecture in the Commonwealth. The list includes properties that have been listed in the National Register of Historic Places and Virginia Landmarks Register, as well as buildings identified by scholars and professionals as notable works of major architects. The Environmental Movement in Virginia Since World War II: Prepared by Dana Bivens, an academic intern at DHR, this research paper examines Virginia’s environmental movement since World War II with particular emphasis on how Virginia’s cultural landscapes have been shaped during that time. How to Research Your Historic Property: This publication provides extensive guidance on how to research all types of historic properties in Virginia. It has been revised and updated to include online materials and digitized archival collections at repositories throughout the Commonwealth.